After a quick visit to Pune, it was time to head back to my home away from home, Mangalore. Having tried VRL on this route, this time I decided to try the pioneer on this route, Canara Pinto. 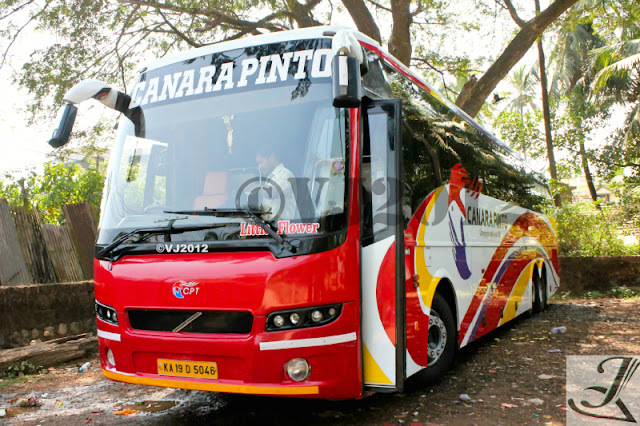 The name Canara Pinto represents safety and comfort among its passengers. Carrying people since 1952, they are one of the trusted operators on this route. When they launched their own B9R service more than a year ago, they became the talk of the town. Ever since I laid my eyes on the bus, I always wanted to try their service and after waiting for so long, it was time to board this service. After enjoying a lovely drive on the Mumbai-Pune expressway and having a yummy lunch it was time to say good bye to Mumbai. I had decided to board the bus at Chembur and reached the place, a good one hour early. This place is a gold mine for any bus fan. Buses heading to Pune and beyond have a pick up point here. Every 5minutes, I would end up spotting a Neeta Volvo or Mercedes buses heading towards Pune. My pick up time was at 14:30 from this place this place and exactly at 14:00hrs, I received a call from the bus stating the bus will be reaching in 15minutes. One thing that I have learnt from my past experiences is that operators from Mangalore strictly follow scheduled timings and this is something which was expected from a niche operator like CPT. Finally at 14:15hrs I could spot my beauty rolling towards me. She was the 'Little Flower' B9R. Since, I knew the crew very well the moment the cleaner saw me, he had a smile on his face and welcomed me in. The driver Mr Ravi was also surprised to see me and welcomed me in and I took my seat. I was the only person who boarded from this point and we moved along. Our next stop was at Deonar, next to HP Petrol Bunk. Here we were joined by the newbie 'Mark'. Both the buses stopped for around 20mins for a bio break. We moved along passing through Vashi Toll Naka, CBD-Belapur and Kalamboli picking up passengers along the route. The bus was running full. I finally sunk into a deep sleep while the bus hit the Mumbai-Pune Expressway. When I woke we had exited the expressway and were cruising towards Wakad. The traffic was thin as we moved along the pickup point in Pune. Very soon we exited Pune and kept on rolling. We crossed Hotel Natraj and moved further. At this point of time I wanted to know where the bus would stop for a tea break. We headed into a petrol bunk before Satara. I asked the crew where there would be stopping for a tea break, they said they would stop only for dinner. While the bus gulped in fuel, passengers took a bio break. We had a brief stop of around 15minutes, enough to give passengers a small break. We resumed our journey further and finally at around 7:30pm pulled over for Dinner at Hotel Navami. As expected a Sheetal non a/c seater welcomed us. The dinner break was again brief; however there was ample amount of time for passengers to have food. Just as we started boarding, Vishal B9R arrived. We finally resumed our journey at around 8:15pm. I finally decided to head up in the front and accompany Mr Ravi at the wheels. We reached Belgaum bypass at around 10:30pm and picked up few more passengers. We continued on and just before reaching Hubli, we took the right turn and headed towards Ankola. We still maintained a constant speed of 100kmph. I was eagerly waiting to see the bus handling the ghat roads. We entered the ghat roads and Mr Ravi showed his skills in negotiating the roads. Finally I decided to get some sleep and asked Ravi, what time we would reach Mangalore, he said depending on the traffic up ahead, we would reach by 6:30am. I finally headed to my seat and slept. I remember waking up at around 5am with the lights turned on in the bus. We had reached Udupi and were dropping off passengers. I tried to stay awake however, I was too sleepy and finally I woke up when the bus was near Lady Hill. I quickly grabbed my bag and headed up ahead. I was dropped off at Lalbagh junction at 5:45am. Will I take this service again? I would not only try this service again but would recommend this service. This service is ideally for people who emphasize on time management. Both the crew was experienced and they were very polite to passengers. I would give a 4.5/5 rating for this service.